VacSmart for MVS Chamber Machines is a new technology to make the hassles of preparing and packaging food disappear faster than the air that leaves a chamber machine! Say goodbye to hours of marination, infusion, and all the pain of food storage and say hello to the future of food packaging and preparation! Ease at the touch of a button. Touch the preset key, place the bag in the machine, close the lid and watch – VacSmart™ does the rest. 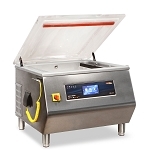 Vacuum seals foods to extend shelf life for chilled storage or Sous Vide cooking. The software returns air in precise small increments, thus allowing the bag to conform slowly to the shape of the food. This preset takes the guess work out of vacuum packaging Fresh Sausage and Hamburger Patties. 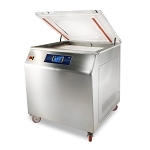 Removes air in increments, preventing moisture from boiling which may harm delicate food items. Create your own flavors or enhance the flavor of fruit infused water, make cold brew coffee, or simply make Sangria in minutes. The chamber stays clean and dry with no boil over of liquids like soup, sauce or custard. Marinate proteins in a hotel pan in minutes, not hours. This preset pulses the protein 3 times, expanding the walls of the protein allowing liquid marinate to penetrate. Do what you do best and let VacSmart take care of the rest. The interactive prompting of food preparation, temperature and pH level questions, eliminates the manual recording of SOPs (Standard Operating Procedures) & CCPs (Critical Control Points). You will love your VacSmart machine. But your health inspector will love you even more. There are two groups of interactive questions, Before Packaging & After Packaging. The questions are preset, selectable, and customizable to your application. In the background, VacSmart automatically records the Start Date/Time, Batch Number, Product Name, Operator Name, and End Date/Time. The programmable VacSmart label printer lets you label your products with fully HACCP-conform label information. Hundreds of customers have successfully written, printed, and submitted their HACCP Plan using HACCP-Portal.com. 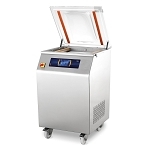 A HACCP Portal license is included with your VacSmart machine. We guide you through the process and do not send you to a referral center. We use our passion for design & technology to inspire chefs all over the world.